Twin-wall Polycarbonate Greenhouses maintain an ideal temperature and protects sensitive plants from strong sunlight exposure. The panels are 100% UV protected and block 99.9% of harmful solar UV rays. 5 Year Limited Warranty. For information on this product, please call our Customer Service Centre at 1-800-866-5749. Create a small garden on balconies & patios and enjoy all the benefits of a full greenhouse. The Grow Station is a workbench, greenhouse and a storage unit all in one. Includes two adjustable heavy duty galvanized steel shelves, hinged lid for ventilation, and unbreakable polycarbonate panels. The Rion Grand Gardener greenhouse features Twin Wall 6 mm polycarbonate panels that create superb insulation and protection for your plants and flowers. Designed for year-round use, the Grand Gardener will provide you with the ideal gardening environment regardless of the season. Double doors allow for easy entry and exit and provide excellent ventilation when opened. The rich hunter green frame is thick and sturdy. The Dutch barn roof design is both elegant and functional with 8 ft. of headroom and 6 ft. 9 in. doors. The Rion Greenhouses can withstand high winds and heavy snow load. All this quality plus the ability to expand your greenhouse makes the Rion Grand Gardener perfect for your gardening needs. Deluxe 6 ft. x 4 ft. Twin Wall Silver Greenhouse Palram Mythos Series greenhouses - Big enough for your dreams, small enough for your budget. Fill your spring and summer gardens with hundreds of mature colourful annuals that you've grown from seeds in your private greenhouse. You can grow everything from vegetables to delicate and exotic plants and winter delicate plants from your garden. Over the winter, you can store plants, tools and other items in the greenhouse open space. The Palram Mythos Series is a true hobbyist greenhouse with everything included. 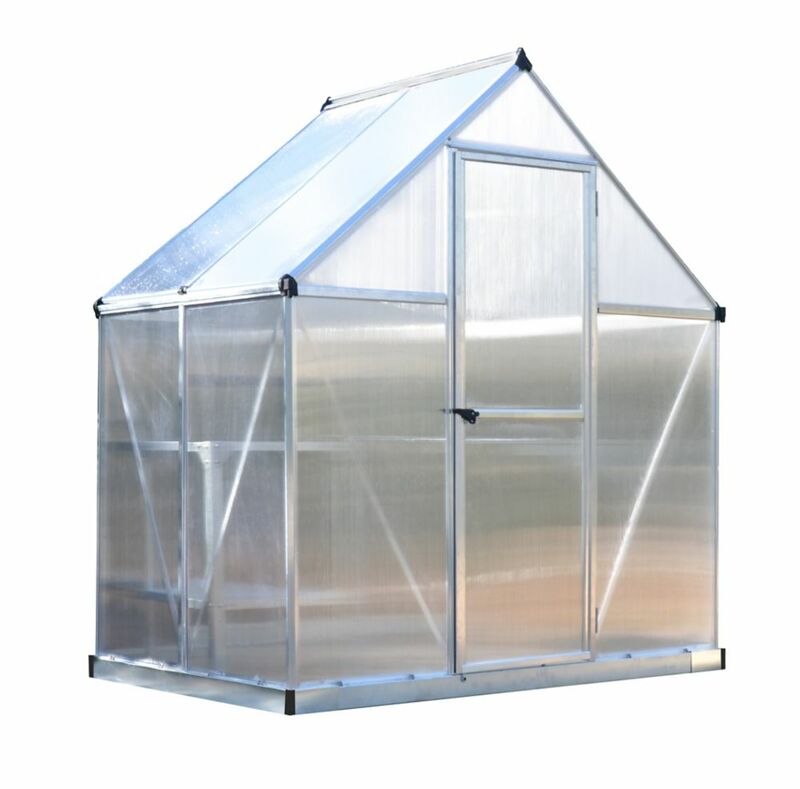 Deluxe 6 ft. x 4 ft. Twin Wall Silver Greenhouse is rated 4.0 out of 5 by 1. Rated 4 out of 5 by Chari from Really like the greenhouse. Really nice greenhouse. The door seems a little flimsy, but that would be my only critique. Took two of us half a day to build, everything fit and worked together good. Perfect size for the space we have. Does this greenhouse come with shelving?